Hoyo De Monterrey "Le Hoyo du Gourmet"
Art of Line Humidors "Body of Women"
Caroni rum, last drops of a lost story. Van Volxem, the passion of Riesling. Château d'Yquem, 400 years of passion. The Gloria Cubana Orgullosos Edición Regional Suiza 2018 is finally available. 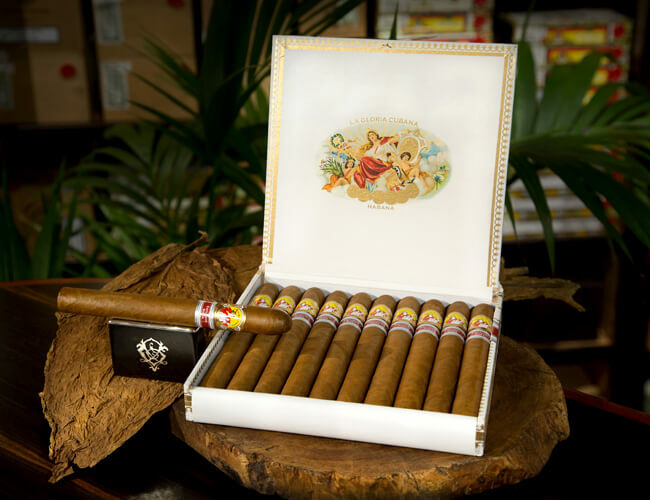 It is called "Orgullosos" which means "proud", in reference to the brand La Gloria Cubana, in other words, the Glory of Cuba. Its production is limited to 6,000 boxes in units of 10. This magnificent "109" size cigar (50 x 184 mm) returns to Switzerland 8 years after its first appearance as the vitola for the 2011 Punch Clasicos. Its wrapper is perfectly applied, taut, oily and an intense Colorado color. Its filling is at the same time dense and supple, one feels that this vitola has passed into the skillful hands of a great Master Torcedor. Raw, scents of cappuccino, green pepper and precious wood emerge. With a slow and traditional ignition match, its start is sweet. The great smoothness of tobacco opens nicely on a beautiful aromatic palette. Nutty flavors, even milky coffee aromas are added with some slightly peppery notes that will enchant this tender woody cigar. Its excellent combustion brings a note of freshness. The draw is remarkable, a clear ash testifies to the great quality of this cigar which ends on a sweet floral note. In conclusion, La Gloria Cubana offers us, with this Regional Edition, a superb cigar that is already without hesitation a "clasico" whose character only needs to improve with time! © 2016 - 2019 - The House of Grauer. All Rights Reserved.